A Forlorn Ballad for Desperate Lost Souls The tradition of rock stars singing about the bottom rung of the working-class ladder has been around as long as rock itself. 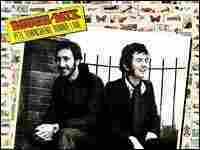 But few did it with such heartbreaking empathy and iridescent beauty as Pete Townshend and Ronnie Lane did on 1977's "Heart to Hang Onto." Song: "Heart to Hang Onto"
The tradition of rock stars singing about the bottom rung of the working class — the lost souls in bars, the kids with dreams that will never materialize — has been around as long as rock itself. But few did it with such heart-breaking empathy and iridescent beauty as Pete Townshend and Ronnie Lane did on "Heart to Hang Onto," an unjustly forgotten highlight from the two men's oft-overlooked, newly reissued 1977 album, Rough Mix. Recorded in between Who projects, and largely the result of an obligation to a record company, Rough Mix has a rustic, open-hearth quality common to Lane's work but too rarely heard in Townshend's. In each verse of "Heart to Hang Onto," Lane sings of a different but equally desperate character: Johnny, who's "always propping up the bar," then Sally, who has "a finger on the pulse of every guy" but never seems happy, and finally Danny, who practices his guitar even though "he won't get far." In the choruses, Townshend becomes their voice, begging for "a heart to hang onto" and "a suit that's tailored new" with such empathy and soul that it's practically possible to see the lump in his throat. The sorrowful Celtic flavor of the melody is broken only by a thunderous, Who-like interlude in which Townshend finally gets to flail at his guitar — a catharsis for lives that will never experience them. But the heartbreaking coda belongs to Lane, the former member of The Small Faces and The Faces, who was himself obscure and forgotten when he died in 1997 of complications from multiple sclerosis. He could have been a character in his own forlorn ballad.